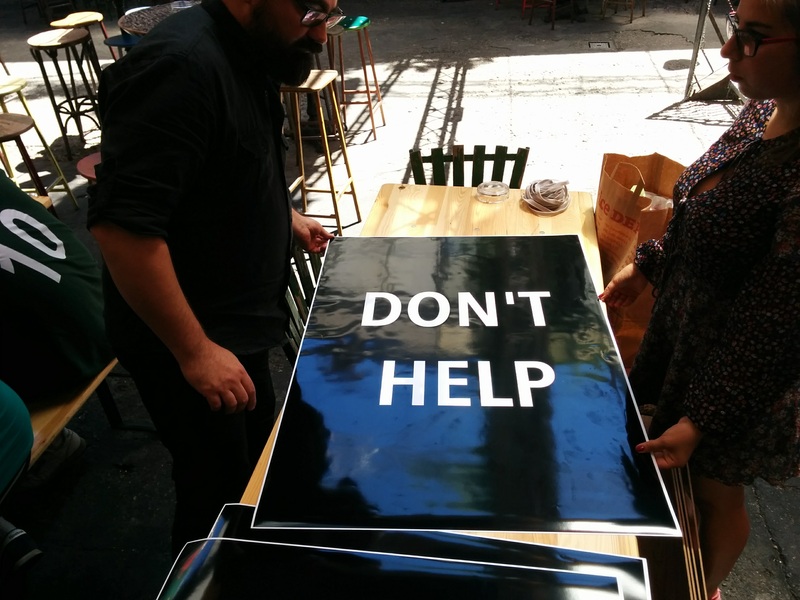 Partners in the project Celebrating Solidarity gathered in Budapest for a workshop on Museum of Solidarity promotion and media event hosted by DemNet on 12-14 June 2017.
finalize ways of distribution and the use of the finalized video in promotion. promoting Museum of Solidarity for media representatives in Hungary on June 13. On 13 June, the team met Luca László, volunteer and main organizer of Segítsünk Együtt a Menekülteknek. 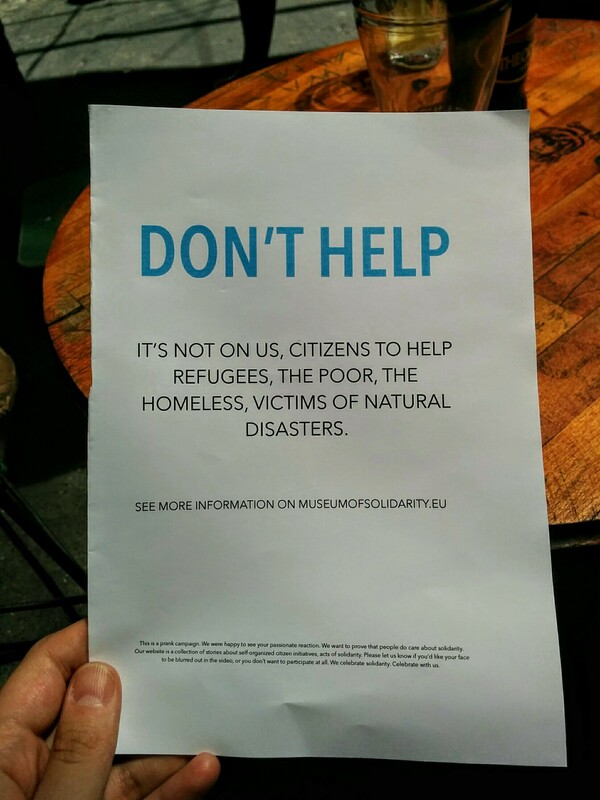 The non-formal group organized in 2015, helping refugees during the refugee crisis in Hungary, mobilizing hundreds of volunteers. The group is featured in one of the leading stories from Hungary on Museum of Solidarity, and Luca is one of the main interviewees in that story. Luca László undertook the most sensible and delicate task in the activity: she volunteered for the role of the ‘provocateur’. After learning her role, and adjusting the equipment she had to wear (body-sign, leaflets, sound recorder) the team conned over each participant’s role, and were ready for action. 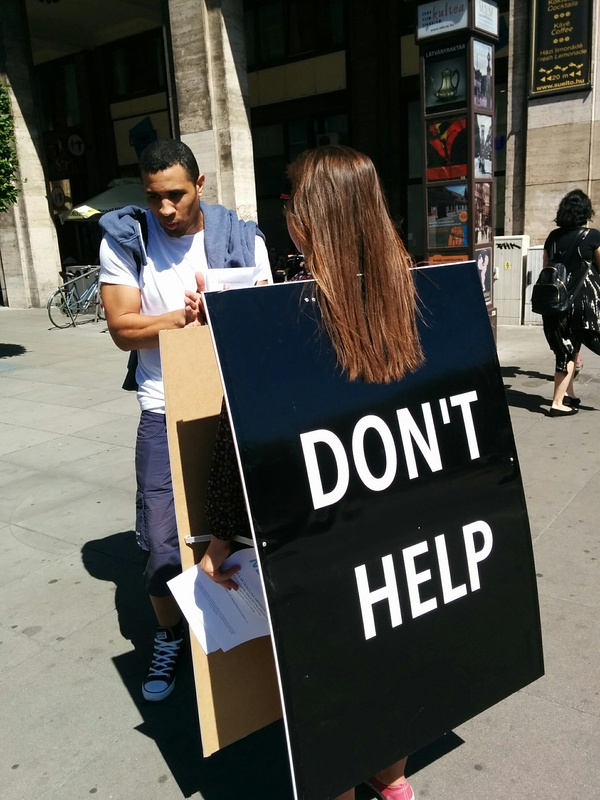 The group recorded Luca on several spots in downtown Budapest, wearing a body-sign ‘DON’T HELP’ (both English and Hungarian) approaching passers-by to take her leaflets, and get to know more about her message. The message was: it’s not on us citizens to help anyone, self-organized, non-formal citizen initiatives are obscure and not controlled, it’s on the state to take care of things. The goal was to provoke people and record their reactions and arguments. Luca was both speaking up and arguing in English and Hungarian, maintaining each conversation to get as many reactions and arguments as possible. The team was hiding in her surroundings, or acted as tourists, recording video and sound with professional equipment and mobile phones as well. Members of the team made sure, each person she got in interaction with, gets a card afterwards with contact details, to be able to request not to be edited in the video, or to be edited with their faces blurred out. Each of them was informed afterwards, it was a prank, and what purpose it served, what we will be promoting with it. 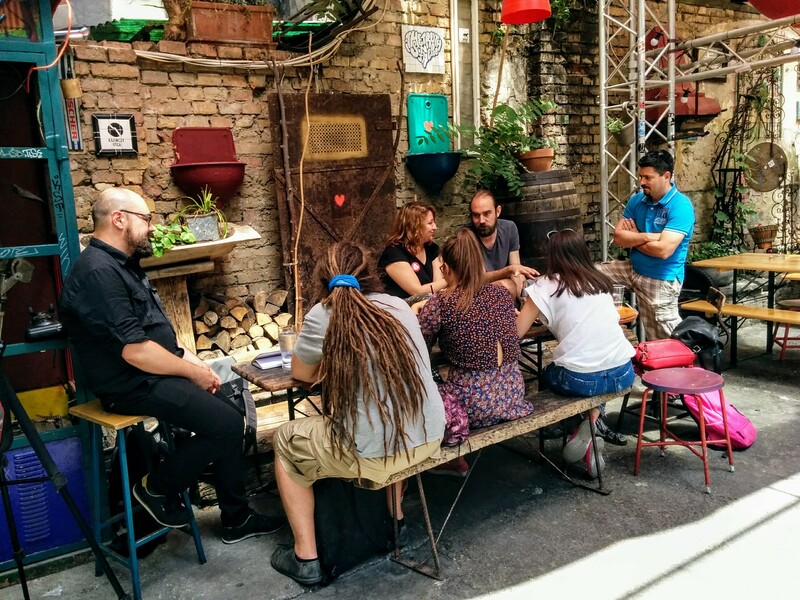 The media event was held in Szimpla Kert on 13 June. Luca László (one of the main organizers of the non-formal civic initiative Let’s Help Refugees Together), Hunor Király (DemNet), developer and editor in chief of Museum of Solidarity, and Vladimir Radinovic (Radiofonia, Poland), chief reporter of the Museum first talked about the video prank, the results, and how it is going to be used in the promotion of Museum of Solidarity. After that the project and the Museum were introduced, with some example stories, and interesting details from shootings and recordings, frequently mentioned issues of the interviewees, and some trends that were recognized during the making. 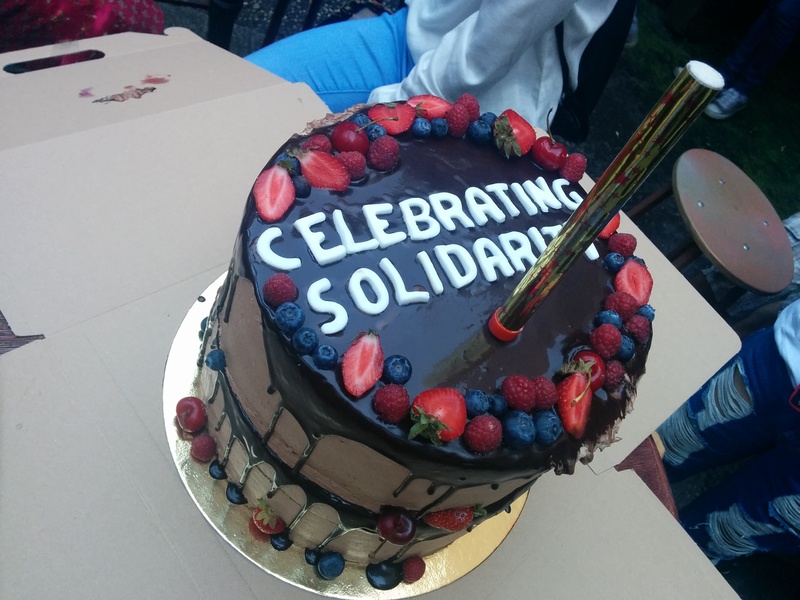 After the panel, a large cake was shared with the audience, as a symbol of celebrating solidarity, and panelists and the partners from all countries of the project pursued informal conversations with the audience. The event was organized as part of the project “Celebrating Solidarity” supported by the EU through the program Europe for Citizens.